Bonjour! Bienvenue á la tour Eiffel. I can just imagine hearing those words as I gaze up at the wonder of the 126-year-old structure known as The Eiffel Tower in Paris, France. The tower is named after its creator, Alexandre Gustave Eiffel who built it in 1889 as the entrance arch to the World’s Fair. Little did he know that this tower would become a cultural icon of France and one of the most recognizable structures on Earth. It’s included in books like The Magic Tree House: Night of the new Magicians by Mary Pope Osbourne and in movies like the Mary Kate and Ashley Olsen title, Passport to Paris. 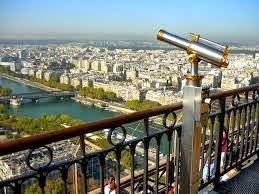 The tower is the tallest structure in Paris and welcomes almost 7 million visitors a year (75% of the visitors are from another country) making it the most visited monument that you have to pay for in the world. It is as high as an 81-story building and has three levels for visitors, with restaurants on the first and second levels. My stomach is starting to rumble at the thought of French food! And I don’t mean French fries! The third level is the observatory platform which is 906 feet above the ground. I hope you aren’t scared of heights! If you want some great exercise to burn off the calories from the delicious food, you can climb down the 300 stairs from the first level to the ground. During its construction, the Eiffel Tower surpassed the Washington Monument to assume the title of the tallest man-made structure in the world. It held that title for 41 years until the Chrysler Building in New York City was built in 1930. But the tower could not be undone and added an aerial atop the tower in 1957, making it 17 feet taller than the Chrysler Building. 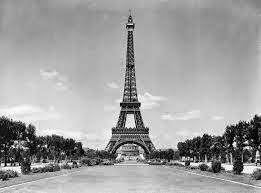 Incredibly, the Eiffel Tower was almost demolished when its 20-year lease on the land expired in 1909, but luckily it was saved due to its value as an antenna for radio transmissions. I cannot imagine a Paris without it! So if you’d like to learn about the Eiffel Tower and more about Paris, France and you can’t afford the trip there, the library is quick way to immerse yourself in the culture that is France. If you love architecture and creating your own buildings with blocks or Legos or simply drawing them, there are lots of books on the subject on our shelves just waiting for you to take them on a trip to your home. So I bid you adieu until the next time!